The Bold Collective designed the new offices for distilled beverage company Pernod Ricard, located in Sydney, Australia. 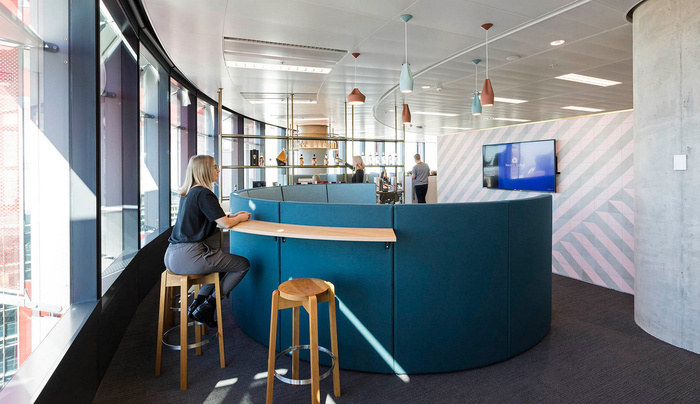 We were delighted to be awarded the Pernod Ricard project in late 2016 and the opportunity to design a workplace within the new Barangaroo precinct. Pernod Ricard were making the transition from a disjointed office in North Ryde to a spacious 2500m2 in Level 43, Tower 1 Barangaroo. The brief was to reflect the premium nature of their brands through a level of sophistication of finishes and refined detailing. A large strategy piece created the roadmap to the new way of working with an agile, neighborhood approach adopted. Consequently, we designed a variety of work settings from collaborative lounges to high benches, innovation zone, huddle spaces, quiet working, enclosed meeting spaces, wine tasting lab and formal boardroom. Pernod Ricard’s tagline ‘Moments of Conviviality’ was translated into the new environment by ensuring that all spaces were inviting and softened through an abundance of vines and plush upholsteries. A celebration of their varied brands was realized through environmental graphics and bespoke joinery display areas for bottles of wine and spirits. The outcome is a flexible, connected and collaborative environment that drives innovation through great planning, design and technology.